Held at Happy Valley Brewing Company, our events are free and open to all ages. Come join us for talks from local astronomers that are accessible to the public while enjoying a nice beer and good food! 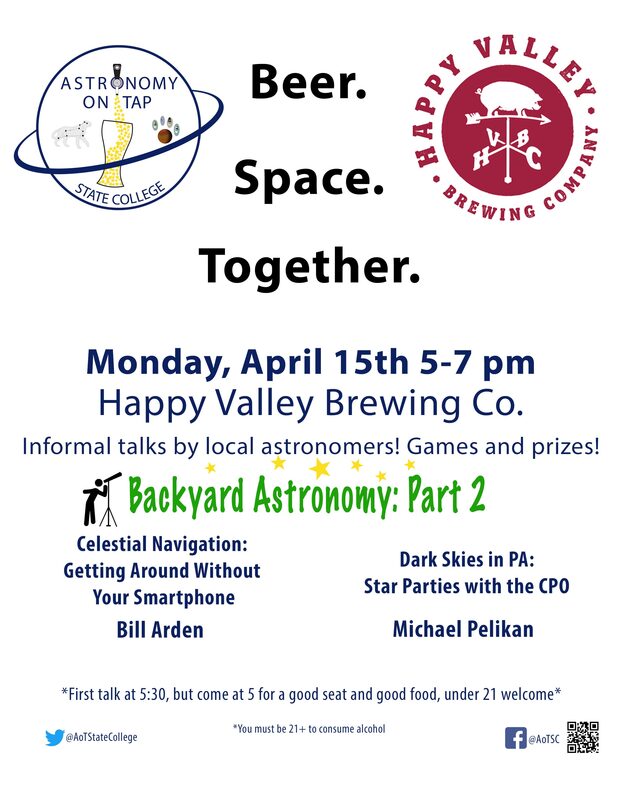 Join Astronomy on Tap State College on April 15th at Happy Valley Brewing company as we discuss some new topics of backyard astronomy. Guest speakers from the Central Pennsylvania Observers will talk about celestial navigation and the Black Forest Star Party held in Cherry Springs State Park every year. As always, trivia and prizes. The first talk starts at 5:30, but come at 5 for a good seat and to take advantage of the 4-6pm happy hour. Also, like/follow our Facebook and Twitter accounts to stay up to date on upcoming events!